The Committee is pleased to announce that a DVD with footage of the Re-enactment March has finally been completed. It includes unique drone footage combined with still and historic images, music as played by the Inverell Pipe Band and the 1st Artillery Army Band from Brisbane. A lovely reminder of a very special day at Inverell on 10 January 2016. 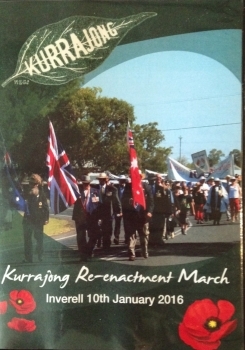 Copies may be purchased in person at Inverell Tourist Centre or for out of town people ordered from the Committee. Cost is $20 plus $3 postage. There are also some Inverell Medals still available at $10 each.